Google could well face Federal Trade Commission sanctions for dropping tracking cookies on Safari users after explicitly telling them that Safari blocked cookies, legal experts predict. "I have trouble seeing how the FTC could ignore this," says Justin Brookman, director of consumer privacy for the digital rights group Center for Democracy & Technology. New York Law School professor James Grimmelmann adds that Google's move is "an open-and-shut" violation of the consent decree it signed with the FTC over the launch of the defunct social network Google Buzz. That agreement calls for Google to accurately represent its privacy practices. 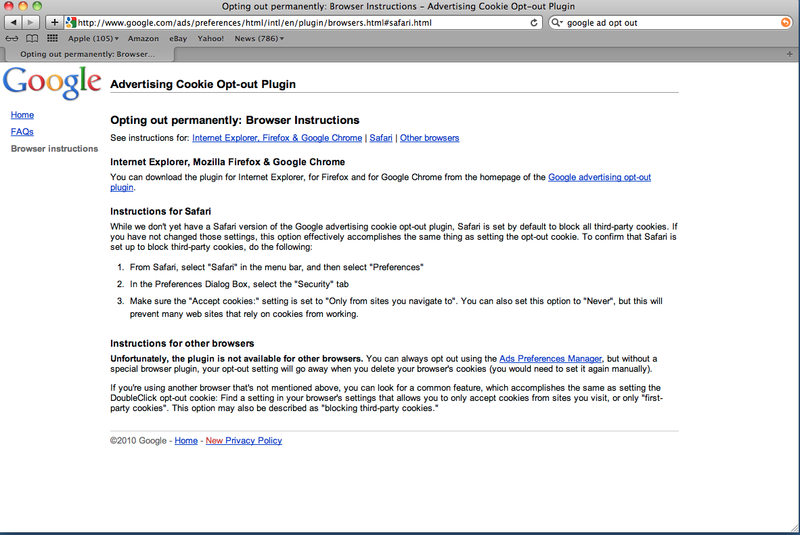 Google explicitly told users that the Safari browser would automatically block cookies. The company has since deleted that language from its site, but Consumer Watchdog saved a screenshot. Google confirmed on Friday that it developed a workaround that enabled it to track Safari users. Google says the workaround was only intended to allow users to post that they liked an ad via the +1 button. Once the workaround was in place, however, Google was able to track Safari users as they surfed the Web. "We didn't anticipate that this would happen, and we have now started removing these advertising cookies from Safari browsers," the company said in a statement. "It’s important to stress that, just as on other browsers, these advertising cookies do not collect personal information." But Grimmelmann counters that Google should have ensured it was honoring its promises to users. "You can't possibly let a company make promises, and then not have the internal controls to make sure those promises are true," he says. Already the three lawmakers -- Ed Markey (D-Mass. ), Joe Barton (R-Texas) and Cliff Stearns (R-Fla.) -- as well as the groups Consumer Watchdog and World Privacy Forum have asked the FTC to investigate Google. "Google's practices could have a wide sweeping impact because Safari is a major Web browser used by millions of Americans," the lawmakers say in a letter to the FTC. The World Privacy Forum specifically takes issue with Google's statement that it didn't anticipate that the technique it used to enable people to say they liked ads would also result in tracking. "Was Google's privacy staff consulted when these actions were taken? "We do not know which answer to this question is more condemning," the group says in an FTC complaint. "If Google failed to consider the privacy consequences of its actions, then its internal privacy function is irrelevant. If the privacy staff raised no objection, then the privacy staff did not comply with the Google Buzz consent agreement." Sen. Jay Rockefeller (D-W.Va.) added in a statement issued on Friday that he intends to investigate whether Google and other companies circumvented consumers' privacy choices. Google wasn't the only company to allegedly drop tracking cookies on Safari users. Gannett's PointRoll, Vibrant Media and WPP's Media Innovation Group also did so, according to The Wall Street Journal. Vibrant Media says it is "addressing the issue." WPP declined to comment on the report. Gannett has not yet responded to MediaPost's queries, but told The Journal that the initiative was aimed at learning how many people went to advertisers' sites after seeing their ads. 1 comment about " Google Under Fire For Tracking Safari Users". John Grono from GAP Research, February 21, 2012 at 5:27 p.m. Agreed Paula. Let's get out the feather to slap them on the wrist.